The book was good. The characters in the story came out to me. And the illustrator, when the pictures came, I really loved it. Especially the page with toads all around it. That one was funny! This story was not real. There’s a grandma in the story named Zelda. She was crazy in a funny way. She did crazy things. And there’s the main character, Jon, and his friend Ella. There are also ghosts in the story. Some are good, some are bad. Some are very mean! The story was really great because of how the story came out, and some parts can be emotional. 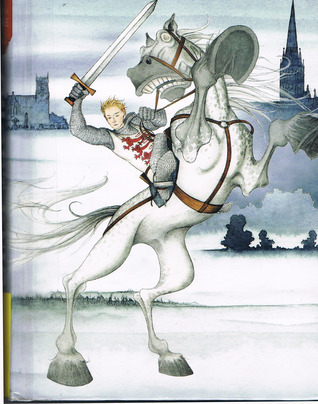 Some are very exciting, if you like adventurous stories, Ghost Knight is probably one you will like. At the beginning of the story, Jon is going to a new school and the place has ghosts in it. He doesn’t know it at first, but then some ghosts come around and start trying to kill him because of his middle name. Ella helps him get into the church to uncover some mysteries, and then Ella gets kidnapped! Jon, Zelda, and a few other allies work to rescue Ella, defeat the evil ghosts, and I cannot tell you the rest! Hopefully when you finish the book, you’ll realize why! The end is so interesting! Great Review, Kurt. It made me want to go now and read this book. Looking forward to your next one. I can’t believe a famous author like you is looking at my blogs! but thank you for the comment. *hugs* Keep up the excellent work, young sir! Good Job Kurt! Looking forward to more reviews from you.